WILLEMSTAD - It was wet and hot last month. This is evident from the monthly weather summary of the Meteorological Service. 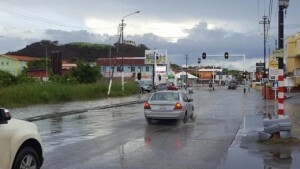 According to the service in November, the island experienced extreme rainfall and the maximum temperature was very high. It was even called a month of extremes, especially if the month is compared to with the weather in the last thirty years. The maximum temperature last month was probably higher than in the last thirty years; the minimum temperature was also an extreme. It was the coldest on November 8 when 22.9 degrees was measured. The maximum temperature measured in November was 34.1 degrees. In November the island experienced more than 28 cm rainfall in 72 hours. That's more than half the total rain that fell in the remaining months of this year.